openSIS is enabled to create various important reports based on scheduling. Following are the reports that you can generate. Admin can print all the student's schedules for his/her own reference. To print Schedules, from the menu panel select Scheduling >> Reports >> Print Schedules. A student search screen opens up. Fill in the required search criteria or click on Submit with blank criteria. List of students appear. Select the Marking Period, include the mailing address by checking the option and select the students before clicking on Create Schedules for Selected Students. The print view of the report is like the following. 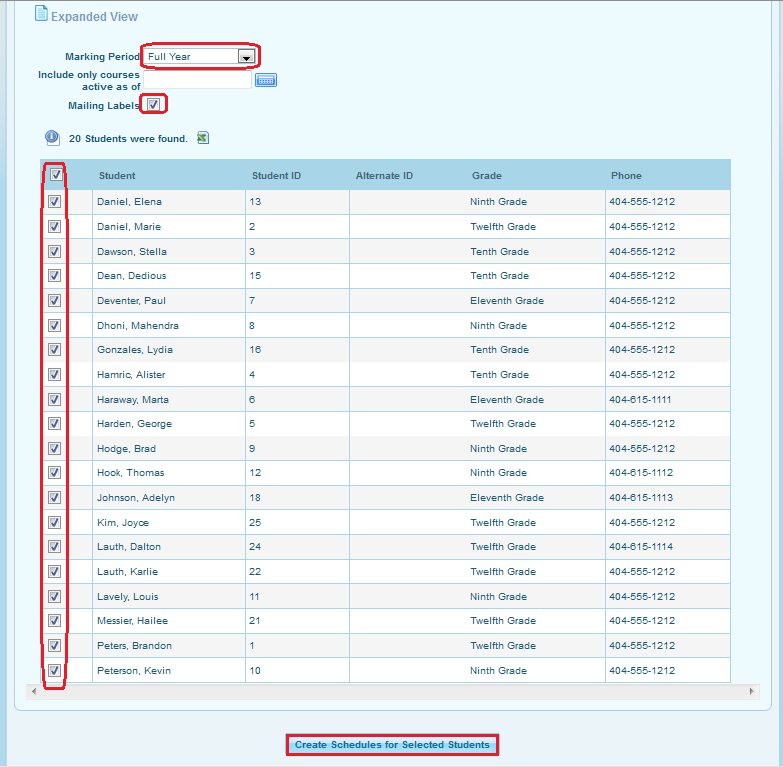 Using this option you can generate a teacher, Subject or Period specific class information report. To create it go to Scheduling >> Reports >> Print Class List. Select the Teacher, Subject or Period if required and click on Submit. If nothing is selected you will get a generic schedule report with the respective teacher's names. Now a screen will appear with Student's General, Address Medical sections at the left and at right you get the Course Periods to select from. Select the details for the students that you would like to see on the report and also select the course periods if required. Then click on Create Class Lists for Selected Course Periods. Now the report will generate with the selected details & will look like the following. This report generates a teacher, subject, period or course/course period specific class of students & teachers pictures in a print form. To generate the report go to Scheduling >> Reports >> Print Class Pictures. Select the teacher, subject, period for filtered list of course periods and click on Submit. Here, we have filtered the list of course periods with the teacher. You may include the teacher as well in the classroom pictures by checking the Include Teacher option, select the course period and click on Create Class Pictures for Selected Course Periods. This report shows the requests made by students for particular courses in a print out form. To generate the report go to Scheduling >> Reports >> Print Requests. Select the students with proper search criteria for whom the report needs to be created. The report would be generated as per the student search. Schedule Report shows the student names who all are enrolled in a course period along with the open seat information for the selected course period. Using this option you can check how many students are scheduled and the number of open seats for the selected course period. Also you get the students name, grade and birth date details. On clicking the student's name would directly fetch you to their schedule page. The request report displays a quantitative summary of all the requests for the courses by the students along with the subject, course details and open seat count. This report displays the list of unfilled(yet to be scheduled) requests for courses based on the teacher or period preferences. To generate the report go to Scheduling >> Reports >> Unfilled Requests. Select the students with proper search criteria for whom the report needs to be created. The report is generated and it shows the list of students with requests that are yet not scheduled. This report displays the list of students that are not scheduled in some periods in school. To generate the report go to Scheduling >> Reports >> Incomplete Requests. Select the students with proper search criteria for whom the report needs to be created. The report is generated and the cross signs under some periods reflect that the students are not scheduled in any course period running in those periods. This report shows the student's enrolment & drop date in a course period according to the selected date range. So you can get a clear idea on the student's enrolled & drop date details. You can also get a printed report on the same.